Home Writing	Do you think that first impressions are generally correct or often wrong? Some people trust their first impressions about a person’s character because they believe these judgments are generally correct. Other people do not judge a person’s character quickly because they believe first impressions are often wrong. Compare these two attitudes. Which attitude do you agree with? Any opinion is, in fact, a judgment. I feel that as Americans we would do well to judge others less often. Still, we must be able to decide whom to spend our time with and whom we’d rather forget. In my opinion, this type of judgment is best after we get to know other people. First impressions are not always accurate impression. 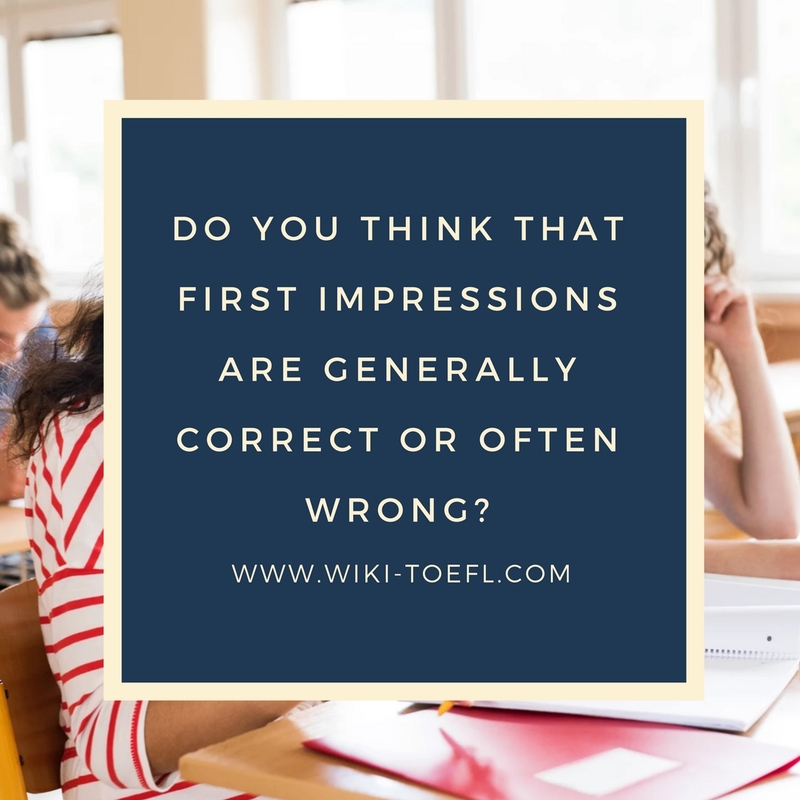 Judging a person based on a first impression does save time. There are more people than anyone could possibly get to know in one lifetime. It is frustrating to waste time getting to know someone, only to find out that your first impression was correct and that you really don’t like him or her. So is it a waste of time getting to know people your probably won’t like? That seems to be a valid point of view, but I believe that it is not the best attitude to take. It’s more humane to spend time getting to know people before judging them. I know that I don’t always make a good first impression even when I truly like the person with whom I am interacting. We all have bad days, I wouldn’t want to lose a job or a potential friendship simply because I picked out the wrong clothing or said something wrong. I think everyone deserves the chances make a second impression. If we all base our final opinion of others on first impression, it would be hard to get to know anyone. There is always more to people than meets the eye. If we don’t give someone a chance, we may be missing out on meeting a life-long friend. That would truly be shame.